For some, the word “garden” brings to mind flowers and ornamental trees and shrubs. However, many of the world’s most famous gardens are defined more by their structures and other built elements than by their plantings. Gardens where the design emphasizes structural elements face special challenges as they age. The test of time, variations in climate, and new standards for public safety all affect how the “architectural garden” is preserved and maintained for future generations. This panel discussion presented different perspectives on the challenges of preserving three different structural gardens. The program was presented by the Friends of Blithewood Garden, the Garden Conservancy, and Bard College, with support from the Hudson River Valley Greenway. Stephen F. Byrns is the founder and president of the Untermyer Gardens Conservancy. A graduate of Princeton and Columbia universities, Byrns is a founding partner of BKSK Architects. He served as a commissioner of the NYC Landmarks Preservation Commission from 2004-10 and on the board of Wave Hill from 2000-10. 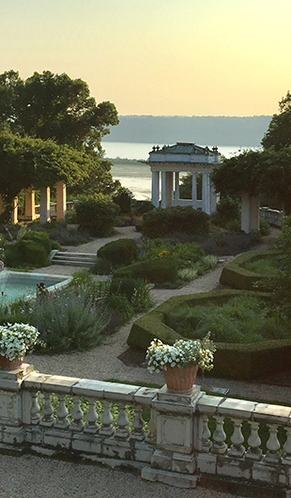 Since its founding in 2011, the Untermyer Gardens Conservancy has initiated numerous critical restoration projects and currently supports a staff of seven horticulturists. Today, the gardens are once again a showplace and are attracting people from near and far. www.untermyergardens.org. James Brayton Hall is the president and CEO of the Garden Conservancy, a national organization headquartered in Garrison, NY. Previously, he was deputy director of the Norton Museum of Art in West Palm Beach, Florida. From 2010 to 2013, he was executive director of the Providence Preservation Society in Rhode Island and served as assistant director of the Museum of Art, Rhode Island School of Design (RISD) from 2006 to 2010. James has a bachelor’s degree in architecture from the University of Virginia and a master’s in landscape architecture from RISD. Learn more about Blithewood Garden.